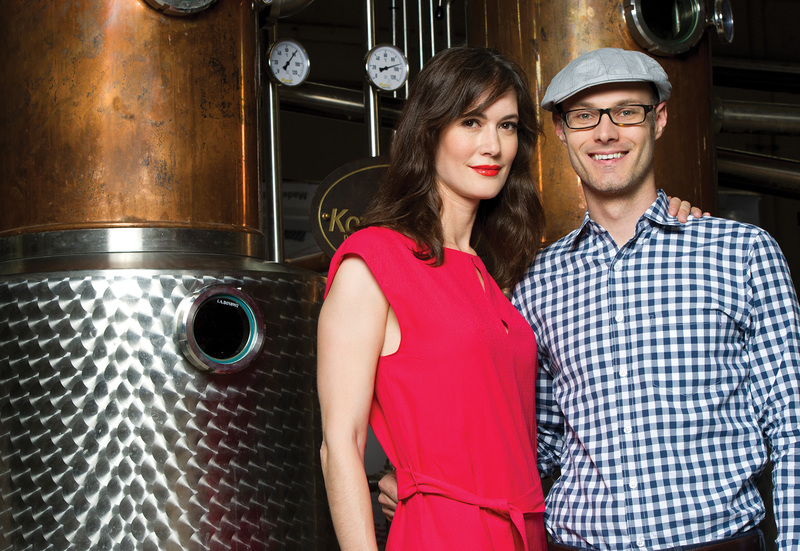 Koval, Chicago’s grain-to-bottle kosher craft distiller. Craft spirits — those from distilleries that annually produce less than 750,000 gallons (i.e., 150,000 bottles) — is one of the fasting-growing segments of the spirits industry. While today accounting for just under 4 percent of U.S. spirits sales, that number has more than doubled in the last five years. Just as the market share has grown, so has the number of craft distilleries; 15 years ago there were only 50 operating in the U.S. while today there are nearly 2000 (with 123 operating in New York State alone). A small but growing number of craft distilleries now have kosher supervision. Foremost of them is Chicago’s Koval distillery. In 2008 the craft distillery movement was just starting to pick up steam. “When we started, we did so with around $30,000 and some help from Visa, Mastercard and American Express. Today, it is very difficult to get into this business without a very large investment or investors,” says Sonat. 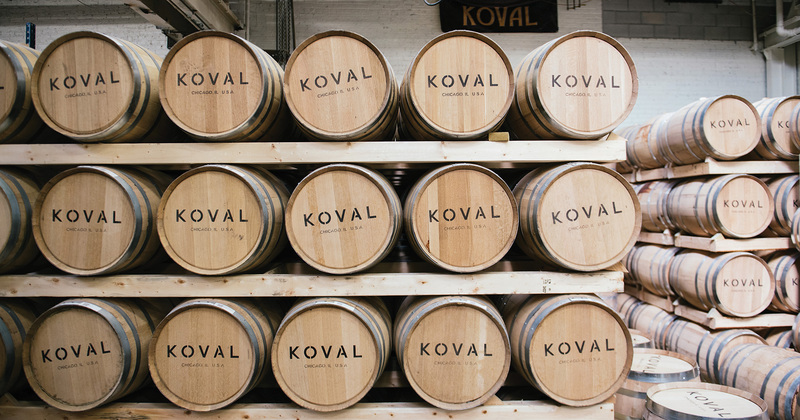 Koval Distillery — like Virginia Catoctin Creek Distillery and Oregon’s Clear Creek Distillery — is a good example of how quality craft distilling and kosher certification can go hand-in-hand. Below are tasting notes for a few of Koval’s current releases. Please note that none of these spirits are kosher for Passover. Koval Single Barrel Bourbon, 47 percent abv: Made from a blend of 51 percent corn and 49 percent millet, and aged for under four years, this caramel-colored whiskey has a sweet and tangy nose of corn and honey, with a strong cereal note and a hint of malt balls. The flavor is sweet, with corn caramel and honey all playing at the front of the palate, moving towards flavors of vanilla and spice at the back of the palate. While nice as a sipping whiskey, it would be better as a choice for cocktails; it makes a nice Manhattan. Koval Single Barrel Rye Whiskey, 40 percent abv: This caramel-colored whiskey is made from 100 percent rye and is aged between two and four years. The lively nose is dominated by rye spice and gingerbread, with notes of toffee and cinnamon, and just a hint of menthol. Look for flavors of rye spice, caramel, toffee and butter cake, with hints of mint and chocolate. Well-balanced, this rye is good for both sipping and cocktails; it makes a very good Old Fashioned. Koval Dry Gin, 47 percent abv: Made from a base of unaged rye whiskey, this delightful gin has a big bouquet of juniper citrus and anise. Look for flavors of grapefruit and juniper at the front of the palate, a spicy mid-palate, and licorice root and fennel on the finish. Well-balanced, this gin is a good choice for citrus-based cocktails; it makes a nice Aviation. Koval Cranberry Gin Liqueur, 30 percent abv: This tart and refreshing cranberry-colored liqueur is made by macerating cranberries in Koval’s dry gin, and then adding sugar. Think of this as the American cousin of England’s Sloe Gin. Look for the flavor and aroma of cranberries playing against juniper, citrus, angelica and star anise. With its tart flavor and lighter viscosity, this liqueur is enjoyable on its own, particularly when served over ice, but would also be good in cocktails; try it as a substitute for Sloe Gin in cocktail recipes. Please Note: Spirits are scored on an ‘A’-‘F’ scale where ‘A’ is excellent, ‘B’ is good, ‘C’ is flawed, ‘D’ is very flawed, and ‘F’ is undrinkable. Prices listed reflect the price at the retailer mentioned.